New Mexico spaceport is open for business. 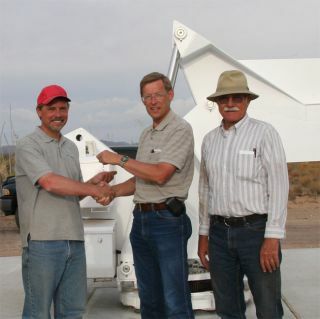 Left to right, Jerry Larson, President of UP Aerospace, Inc. receives keys last week to the spaceport from Bill Gutman, representing the New Mexico Office for Space Commercialization. James Thomas, Chief Engineer for the UP Aerospace launch site infrastructure smiles approvingly. Image Courtesy: UP Aerospace, Inc.
Workat the New Mexico spaceport has reached a milestone as facilities are ready tosupport the first rocket flight from the site--now targeted for July. Meanwhile,state planners have issued a request for proposals to design and engineerthe scaled up Southwest Regional Spaceport, the needed hangers, control andsupport buildings, roads, utilities, launch pads, fuel storage facilities, andother infrastructure requirements. Locationof the New Mexico spaceport--some 45 miles north of Las Cruces and 30 miles eastof Truth or Consequences--is a remote area near Upham that is favored due to lowpopulation density, uncongested airspace, and high elevation. TheState of New Mexico Economic Development Department is currently working withvarious commercial space operations to establish the new Southwest RegionalSpaceport at Upham. Creation of the spaceport is considered a key component inthe state's bid to attract space-related business to New Mexico. "Thespaceport has come to life," said Jerry Larson, president of Connecticut-basedUP Aerospace, Inc.--the group that will conduct an inaugural rocket blastoff andfollow-on flights from the New Mexico spaceport grounds. "The spaceport is openfor business," he told SPACE.com. Larsonsaid that last week that key elements to support the launch of the UP AerospaceSpaceLoft XL suborbital rocket are now in place. A launch pad and rail, a custom-builtrolling rocket enclosure, storage facilities, launch control center, andpayload processing center are on site. Thesemobile, temporary structures "could work for us for quite a few years," Larsonsaid. Still ahead for the state is finishing up an Environmental ImpactStatement--critical to obtaining a spaceport license from the Federal AviationAdministration's Associate Administrator for Commercial Space Transportation in Washington, D.C.
Giventhe temporary nature of the infrastructure at the spaceport property, UPAerospace can initiate its suborbital launch plans. "It'sall been plunked down ... the spaceport has come to life," Larson said. Spaceportconstruction crews have put in place the culmination of some six months ofengineering and fabrication work, he added. "We'vebeen given the keys to the spaceport ... the baton has been handed to us. Nowwe're going to carry it forward and get ready for flight in July," Larson said. "Our 56-foot-talllauncher has now been craned onto the launch pad. It's exciting to see themobile launch facilities now in position. These major on-site milestones willallow us to execute our site-activation plan -- culminating in the multiplespace launches we have scheduled for this year," said Eric Knight, ChiefExecutive Officer for UP Aerospace. "With all the major facilities now inplace, we can begin to firm up our 2006 space-launch calendar." Knighttold SPACE.com that it is realistic to expect a mid-summer launch toinaugurate the spaceport. "As it looks right now, July would be an excellent--andvery achievable--target." Thereis, however, no intent to rush the process to meet some artificial deadline. "We'll be flying vehicles into space from New Mexico for many years tocome. Doing it right -- and safely -- are our ultimate measures ofsuccess," Knight emphasized. TheSpaceLoft XL offers enough oomph to carry a wide variety of payloads on themaiden flight out of the spaceport, Larson said. The types of payloads, headded, include a number of items from customers that can't be revealed at thistime, he said. "Whenyou hear about what they are ... you'll be amazed. It's kind of refreshing tohear what some of those are," Larson noted. Toreach a July liftoff of the UP Aerospace SpaceLoft XL there is considerable workahead. Larsonsaid that a check list of items includes site activation, hooking up computers,laying down wiring, installing radio transmitters--"basically, put it alltogether so we can operate and launch the rocket." Inthe mid-May time frame, UP Aerospace will carry out "pathfinder" work at thespaceport. This will involve an inert rocket--the flight vehicle sans rocket motor. "This will help us work through all the procedures needed to be able to operateand handle ordinance and rocket safely," Larson explained. Follow-ontesting phase work at the spaceport includes separation staging run-throughs ofthe rocket to check out parachute deployments. "Oncewe're done with the testing phase, then we're ready to start the launchcampaign. That consists of having the rocket motor delivered, processing themotor and its igniter, and getting the rocket ready to go," Larson said. Larsonsaid watching the stepped up spaceport work has been nerve-wracking. "I'm notused to being around big, heavy equipment that lifts all of the heavy structures... especially my launcher which I worked on, design-wise, for almost a yearnow." "Butnow that it's finally all on the ground ... I slept easy last night," Larsonadmitted.